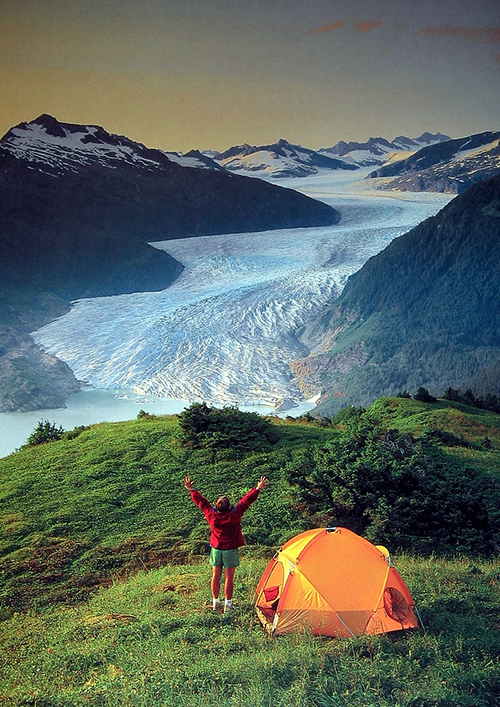 Alaska hiking, trekking and backpacking tours for individual visitors of Denali National Park. Come, visit Alaska and join our small groups for an in-depth and unparalled backcountry adventure within the "Land of the Midnight Sun". Our 3 - to 5.5 hour guided excursions provide an in-depth view of the environmental, historical and scientific significance of Alaska’s awe-inspiring wilderness. They also place you amid some of the world’s most breathtaking scenery, so be sure to bring your camera. Please contact us for additional information and reservations. DE #1 Triple Lakes Trail US$99.00 p.p. The Triple Lakes Trail inside Denali National Park is an exciting new offering providing visitors with one of the best opportunities for a serene immersion into the boreal forest of Interior Alaska. This adventure on an improved trail inside Denali National Park begins with a gradual and consistent hill climb providing spectacular views of the Nenana River and the expansive glaciallycarved Yanert Valley. This Alaska trail then descends and levels off to provide access to the three alpine lakes that give this Alaska trail its name. Beautiful views of the lakes, bounded by the elevated ridges, make for some outstanding photo opportunities. The lakes are abundant with arctic grayling and also home to resident beavers. Moose enjoy the sheltered valley and other small mammals are abundant increasing the opportunity for wildlife viewing. Countless wildflowers dot the hillsides adjacent to the trails and wild blueberries are abundant in August. This is a “must do” Alaska hike for any Denali visitor desiring to experience some solitude. This Alaska hike is rated moderately strenuous due to the reasonably steep ascent at the onset of this hike. Only avid hikers with appropriate conditioning and footwear should consider this option. The round trip for this Alaska hike is approximately 4 miles and the estimated duration is 3 – 3 ½ hours. Two person minimum is required. AH #2 Steps through Time US$99.00 p.p. Experience the concept of true wilderness by stepping away from the developed areas and immersing yourself in the tranquility of a hike through the mixed spruce, birch and alder forest that encompass the Denali area and Interior Alaska. This guided hike will set you on the trail of discovery and adventure as your certified guide interprets many of the unique natural attributes of the area. Follow the trail of frontier hunters on the way to an old hunting cabin and take in some of the spectacular scenery on this invigorating hike. The trail is rustic and leads away from the lodge, gradually enveloping the hiker into a quiet and refreshing environment. You’ll get a bird’s eye view of the glacially-carved Nenana River valley. The guide will help in your understanding of the immense power and magnitude of the forces that shaped the land. This is a moderately strenuous to difficult hike and proper footwear is essential in order to provide for good, secure footing along the trail. You’ll need to step over exposed roots and around wet areas and boulder hop over Lynx Creek. The trail rises in elevation at various spots and can provide a moderately strenuous workout for most participants. Sightings of fox, moose, dall sheep and numerous birds are always possible, but the scenery is what this trail is mostly about. This is a well marked but unimproved trail still used by hikers, backpackers, and hunters to easily access some of the most beautiful wilderness areas of Denali. AH #3 Denali Wilderness Hike US$94.00 p.p. For the active traveler, a Denali Wilderness Hike is the perfect way to discover this amazing place. This hike usually involves substantial elevation gain, getting you up to the big views above tree line. The trail is not steep or difficult, but a long, steady climb makes this trip fairly strenuous. Explore the Alaskan wilderness on an exhilarating trek in the heart of Denali State Park. Hike through lush vegetation along forested trails while your guide tells you about the local history and wildlife of the area. Climb above tree line (weather permitting) for spectacular views of the Alaska Range, glaciers, and Mt. McKinley. Enjoy a freshly prepared picnic lunch while scanning the mountainside and valleys for foraging bears. Photographic opportunities abound-from majestic alpine vistas to delicate wildflowers and berries. Denali hiking doesn't get any better than this! This is a great trip in any weather. 5.5 hours. Hikes range from 5 to 7 miles and may involve challenging terrain on established trails. Sturdy hiking shoes recommended. Bring rain gear, insect repellent, bottled water, and dress for current weather conditions. Trail routes may vary due to trail and weather conditions. 2:15pm at our Byers Lake office in Denali State Park or 2pm pickup at the McKinley Princess Lodge.